or worrying about having to repeat yourself. so that people will definitely understand what you say. You have the power to improve how you speak. You know that you don't sound like a native speaker. You’ve been speaking English for years. You probably even live and work in the United States or Canada already. Your language skills are good, even excellent. You're not worried about your vocabulary or your fluency. You’re tired of being asked to repeat yourself. You want to feel confident that people will be listening to your words, not your accent. At work, you are constantly presenting your ideas to native speakers. Meetings, conference calls, lectures, workshops, networking events, even happy hour - you want to be sure you're speaking clearly and effectively. After all, that first impression counts: you want other people to feel completely certain that they understand you. You want a better accent. I'll help you get there. Chances are you've spent plenty of time and energy troubleshooting your accent over the years. With so many resources on the internet, you're probably aware of how you want to sound and have a vague idea of how to get there. I've never worked with someone who was completely new to the process. Most people have tried lots of methods: books, recordings, YouTube videos, online resources, maybe downloading an app, or asking native speaking friends for advice. Most accent resources focus on fixing the way you pronounce consonant and vowel sounds. While this is helpful if your native language is really different than English, how you say certain sounds is only one part of a natural-sounding accent (and it’s not the most important one). If you want to be understood by native speakers, you need to speak with the rhythm and music of English. In other words, you need to master word and sentence stress, emphasize key words, and break your ideas into smaller, digestible chunks. Stress Simplified will guide you through the process step-by-step. Want to know the reasons most non-native speakers avoid improving their word and sentence stress? of the rhythm that native speakers use automatically. You don’t have to spend months or years analyzing accents or piecing bits of knowledge together to master stress patterns. You’ll learn why you need to consistently stress words by emphasizing the right syllables. We’ll start with the fundamental elements that you need to work on in order to produce the natural rhythm of English: pitch, volume, and syllable length. You’ll learn how to gain control of your pitch, vary your volume, and lengthen syllables to speak clearly and effectively. And you’ll practice with my favorite techniques to help you remember how stress feels in your mouth and your body. Next, you’ll learn how to create the natural rhythm of English through contrast between stressed and unstressed syllables. You’ll find out how word stress gives you time to move through all of the shapes required to pronounce words accurately. You’ll learn how to emphasize vowel sounds on the right syllables and how to move your mouth, link sounds together, and shift your pitch so that you sound less choppy and more fluid. With this solid foundation, I’ll show you how to identify which syllable to stress in words you use all the time. By following my suggestions, you’ll train your ear to notice stress patterns in words and phrases you hear. You’ll learn what to do in order to ensure you remember these patterns and produce them consistently. Now that you understand how to identify stress patterns, we’ll make the process simpler by talking about guidelines for predictable patterns. Because so many of these words are common in professional and academic environments (and everyday life), practicing them will get you using word stress more consistently. By drilling these patterns through the 30-day boot camp, you'll do powerful work to train your ear and your mouth. In this program, you’ll work with 30+ drills in a 30-day bootcamp designed for results. You’ll train your ear to hear and listen for these patterns and stretch your mouth and vocal cords so that you can produce them! As you move through Stress Simplified, I’ll remind you to check in and reflect on how you’re using your mouth and voice. You'll be pleasantly surprised to discover that English rhythm does become easier day after day! Building on the momentum you’ve gained through regular practice, you’ll focus your attention on sentence stress. You’ll learn how to draw attention to the most important words in your speech so that they’re extra clear and easy to understand. You’ll discover that when you emphasize the words that carry the most meaning, you help your listener follow what’s important. You’ll find out how to shift the focus of your sentence by putting extra emphasis on different words. You’ll learn how sentence stress is connected to intonation and can be used to make your meaning and your feelings clear. Last, we’ll talk about how to make it even easier for your listener to follow what you’re saying by breaking your ideas into shorter pieces. You’ll find out why you hear different levels of stress when listening to native speakers. You’ll learn how to separate your words into logical chunks, or thought groups, and which words to emphasize for extra clarity, emphasis, or effect. You’ll discover how to breathe in English, as well as how to pause deliberately and change your tone to keep your listener engaged and interested in what you’re saying. Of course, you’ll practice with clear examples so you can start doing it on your own. 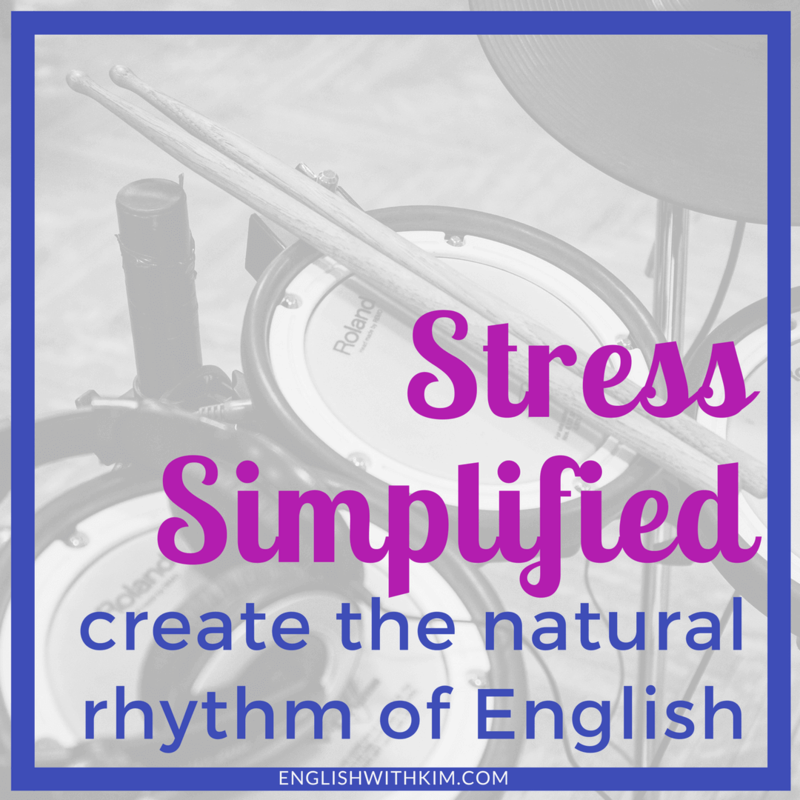 As you finish the Stress Simplified program, you’ll be able to test your mastery of stress patterns so that you can see how well you’ve absorbed the rhythm of English. You’ll find out the best ways to practice word and sentence stress and thought groups on your own so that you feel more confident when speaking. Last but not least, I’ll show you how to measure your own progress and reflect on what still needs work. By consistently spending at least five minutes a day working with the Stress Simplified exercises, you’re doing a lot of subtle but essential work. You’re training your ear to be more sensitive so that it can hear lengthened syllables, notice more variation in pitch, and pick up on changes in volume. You’re stretching your mouth so that it can glide into new shapes. You’re exercising your vocal cords so that they feel more comfortable producing the sounds of English. So much of accent reduction is about creating muscle memory, just as you would at the gym! Even if you don’t have the privacy to speak out loud, you can simply listen to the practice exercises and repeat the words silently to yourself on your commute or at the office. You don’t need to move through the drills quickly; in fact, you’ll get better results if you continue to practice them over time. Remember, accent reduction is an ongoing process and you’ll continue to come back to this information as you refine and improve how you sound when speaking. That’s what makes this program so valuable: you basically have an accent coach in your pocket, whenever you need to practice! Once you start noticing, absorbing, and producing the stress patterns in words and phrases, you’ll quickly discover that native speakers more easily understand you. When you sound more like a native speaker, you feel more confident that people will be listening to your ideas, rather than trying to decipher your accent. By emphasizing the right syllables in words you use all the time in your personal and professional life, you can trust that people understand what you’re saying. When you separate your ideas into shorter, digestible chunks, you’ll be able to keep people’s attention for longer. Most importantly, you’ll speak more powerfully because you know you’re highlighting the words and ideas that you want people to care about. If you commit to practicing with at least one exercise each and every day, you will get results. When you apply what you learn in this course to your real-life needs, goals, and desires, you’ll feel more confident in the situations where your accent truly counts. Stress Simplified is straightforward and easy-to-follow. You can complete the program on your own schedule, but you'll get the best results with consistent practice over 6-8 weeks. This program is designed to get you the same results you would achieve through one-to-one coaching, without the expense or scheduling conflicts. You have the option of signing up for a self-guided program, or working with me through an initial accent assessment, eight weekly assignments on WhatsApp, and a final evaluation. Stress Simplified is a comprehensive and effective program that you can take anywhere. Kim has an engaging and practical way of teaching sounding natural. She is big on "musicality" of English so she trained me hard on intonation and length of pronunciation. She has phenomenal ears that could single out the subtle differences in my accent. I am very impressed with the thoroughness and expertise you demonstrated. I've been following your suggestions ever since and I've already seen improvements. Finally, not only you gave me invaluable suggestions and info to improve my speaking, but you also boosted my overall confidence. After working with you, I feel more confident interacting with people. I can now use my English to get into a deeper conversation, but I wasn’t able to do that before because I was constantly worried about my accent. I’m not a perfectionist anymore, once I got rid of the idea of being a perfectionist, I’m actually one step closer to being more perfect. Click the "I'm in! Let's do this!" button below. You'll be redirected to the course payment page. Pay for the program with your credit or debit card or Paypal. Receive immediate access to all course materials. Get started working on your word and sentence stress! You're that much closer to sounding natural! You can review the complete contents of the program over on the course site. Joining now and starting right away means you can finally feel more confident about how you sound when speaking English. And you can continue to study the materials as much as you want, for as long as you want! I’m Kim, and I'm an accent reduction and communication coach. I work with motivated non-native English speakers who want to sound more natural, more professional, and more fluent in English so that they can achieve their personal, professional, and academic goals. I know how important it is to be able to connect with other people in a language that isn’t our first. I speak Spanish fluently, but I recently realized that my American stress and intonation is causing my accent in Spanish. I wish a program like this existed for me! I love demystifying the accent reduction process - it IS possible for you and you CAN sound more like a native speaker. Nothing inspires me more than watching my clients grow more confident and more comfortable speaking up, and hearing them transform how they sound. I know how much you are struggling to reduce your accent all by yourself. It takes time. It takes effort. And after so much time spent looking through and experimenting with other resources on your own, you may be feeling overwhelmed or even discouraged. You need structure and support. I'd love the opportunity to guide you. I've developed this approach through years of coaching clients on how to improve their speech and reduce their accent. I've included all the "secrets" I know so you can fine-tune your speaking and finally master English rhythm through stress. I'm in! Let's create the rhythm of English. This program is for high intermediate, advanced and fluent non-native English speakers who can follow fast, natural spoken English. If you feel comfortable understanding me in my YouTube videos, you'll do fine in this program. This program will also help you understand the rhythm of native speech, so your listening skills with get stronger too. You can also adjust the speed of the videos if you need to, and the each video is followed by a transcript, in addition to the PDF guidebook with complete transcripts, if you want to check what you heard. Yes! Word and sentence stress are challenging for most non-native speakers. I have worked with people from all regions of the world, including Asia, Africa, the Middle East, Europe, and Latin America. Most languages are what we call syllable-timed languages, which means you pronounce each syllable more or less the same length. Other stress-timed languages use stress differently, and you will still need to adjust to English rhythm. Even native speakers of Indian or African English may choose to adjust to American English stress patterns as their native dialects tend to be more syllable-timed. If you're wondering if this program can help speakers of your native language, please email me using the contact form at the bottom of the page and I will be happy to answer your questions! This is a self-guided program, which means you can take as much time as you need to complete the program. That said, Stress Simplified is designed to take place over 6-8 weeks. I suggest you commit to spending 10-30 minutes every day on the practice exercises so that you start seeing results as soon as possible. You need a phone, tablet, or computer that can access the internet. The course is hosted on a platform available on all devices. You will need the ability to stream videos, download MP3s, and open PDF documents. You need to give yourself at least 10-30 minutes a day to watch the video lessons and practice. You can pay with your credit or debit card or Paypal. When you go to the course site, you'll be redirected to a secure payment processor where you can choose the option that works best for you. After payment, you'll receive an email confirming your payment and you can finish creating your account for immediate access to the course site. If I don't like the program, can I cancel? Because this is a digital program with dozens of downloadable resources, purchases are non-refundable. However, I want you to be happy with your investment; if you are not happy with the program, please contact me directly so we can work together to find a solution. Learn more about my course policies here. To see if you benefit from working on your word and sentence stress, try the Stress Starter Kit. Will I receive your feedback on my accent? Stress Simplified is available as a self-guided program because many people told me they wanted to work through the process independently, on their own schedule, without investing in one-to-one coaching. For this reason, I provide guidance on how to record yourself before you start and evaluate your accent after finishing the program. If you want additional attention and feedback, contact me to learn more about the complete Stress Simplified program, which includes an initial accent assessment, eight weekly assignments with feedback by WhatsApp or voice recording, and a final evaluation when you complete the program. I'm confident you'll make progress by following the guidance in the video lessons and practice exercises, but I do offer additional coaching if you're interested in investing in more personalized feedback. This program works if you do. After years as an accent coach, I have created a well-structured program that will help you reduce your accent, speak English more clearly, and express yourself more naturally and more like a native speaker. However, to get results, you need to do the work: you need to watch the video lessons, practice consistently using the MP3 exercises and 3o-day plan, and complete the exercises in the PDF guidebook and workbook. The only way to reduce your accent is through consistent practice. Can I see a sample of what's inside the program? To get a sense of what you'll learn inside the program, sign up for the Stress Starter Kit, a five-day email course that will help you get started with word and sentence stress and sample the types of exercises that are inside the program. You can also watch the first video lesson in the Stress Simplified program here and scroll through the course outline on that page. More questions? I've got answers. You agree to share your name and email address with Kim so that she can respond to your message. The data from this form will be sent directly to Kim's email account and will only be used to respond to your inquiry. Please check the box to accept and then send the message.